I had great fun starting a Glue Book with an old hardback version of 'What Katy Did Next' and using the theme of vintage sewing. I seem to have collected numerous vintage images and other scraps that I don't want to throw away and thought this would be a good way to use them up. Do you remember the old Simplicity and Vogue patterns? For this project though I created some background images using digital files and merged them in PSE, adding other elements to create collage pages. Sewing is very dear to my heart, although I rarely use the sewing machine with fabric any more, but it was my dear Mum who taught me how to make my own clothes when I was very young. She was a great inspiration, having no formal training herself. There are some fabulous pieces on the Gingersnaps blog so let's see what you create. oh i love anything connected to sewing - as in my time i have done loads.. i have made wedding dresses , suits , all sorts - but now adays its much cheaper to buy .. This is absolutely gorgeous Brenda and the scraps are very like some I have that came from my dear Mum who loved sewing and always made dresses for me and my sister when we were little. I've gone all nostalgic now! 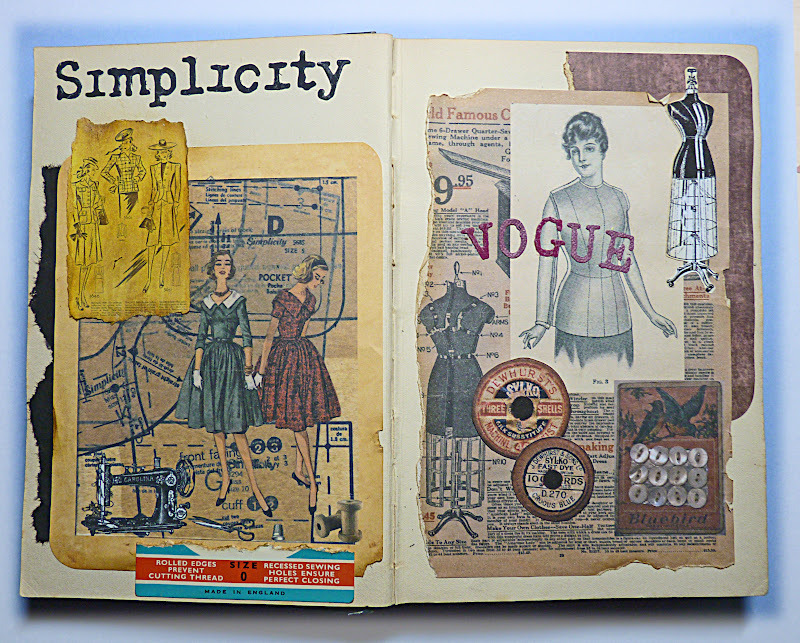 Are Simplicity patterns old? lol...thinking on the bright side - this reminds me of my childhood and makes me feel young...lovely memories. Really beautiful, Brenda...love all details! What a nostalgia trip I've just had.... I remember What Katy Did too... your book is great. 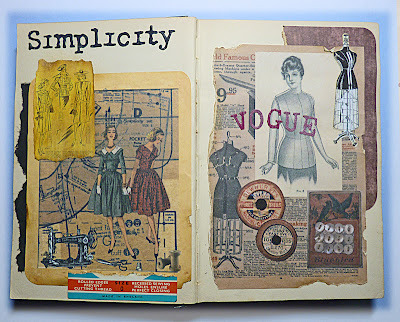 Fantastic book pages, love the collage. Must look out my old pattens. Do you know how I wish I had kept some of those very old pattern packets?? 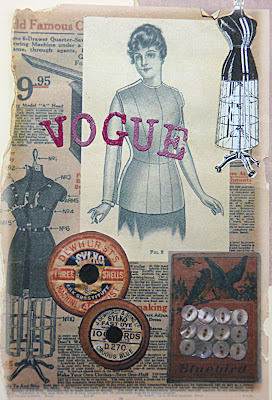 These are fabulous pages with all that old vintage charm! Hugs! 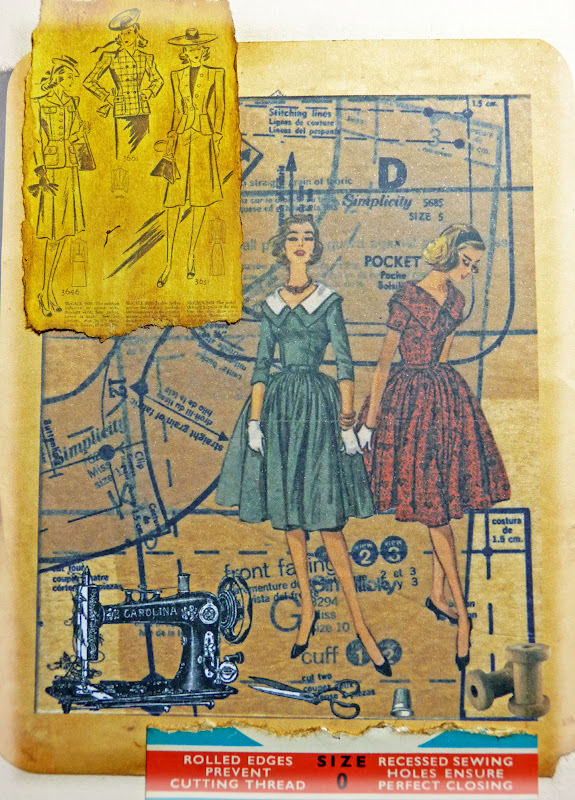 A fabulous collage, I love the sewing themes and these 'old' images bring back so many memories. Wow! this is fab Brenda. I love all the images and details - gorgeous layout! I certainly do remember all those patterns. My mum used to make a lot of my dresses when I was younger and she would take me to the local material shop to choose fabrics and a pattern. I remember getting really excited and couldn't wait to see it finished!! Wonderful memories!! Dear Brenda, this pages are just so stunning! Amazing interpretation of the theme. Sounds to be a great project, looking forward to your next pages. I love your sewing collages!